Over spring break, I spent a week on Green Gulch Farm, a zen center in the Marin Headlands north of San Francisco. I stayed there as a guest student and followed the schedule of the center. The routine of the day encouraged me to deepen my practice of mindfulness in a way that I had been unable to do so before. I've searched for the words to describe the state that being at Green Gulch put me in and the closest I have is the idea of an extended deep breath. You know how before a trying moment, you steel yourself with a generous breath and create a small clearing in your mind for the chaos to come? Or, taking a step further, how a quiet, effortless morning invigorates you for the challenges of the upcoming day? One step more and you have what it was like for me at Green Gulch: a week-long deep breath. Within the quiet of that deep breath, I was surprised at how little there was for my mind to chase. I had just finished up a quarter at law school, meaning I was in-between one of the four seasons of responsibility as a law student (three quarters and a summer job every year). I was empty. I mean this in a completely positive sense: I was able to receive every moment with care and joy. I rested gratefully in this refreshing emptiness knowing that I was to return to a life of action soon. In the middle of the week, the schedule is interrupted by a completely free day. I used the time to walk to Muir Woods and back. I say this with no exaggeration: Muir Woods is one of my favorite places on earth. A walk through these woods brings out the best of nature's colors: vibrant greens and rich browns. Trees mean so much to me. They represent powerful metaphors of wisdom, effortlessness, growth, and community. As I inhaled the rich air -- offerings of these great redwoods -- I couldn't shake a phrase: trees sitting zazen. Zazen is the word used to describe Zen meditation, the foundation of Zen Buddhist practice. The redwoods in Muir Woods were sitting zazen as I gently greeted them that day, nobly pondering the quiet. They had sitting zazen been for a long time and they would continue sitting in silence until they returned to the ground from their great heights. There's a particular part of Muir Woods that I cherish called Cathedral Grove, a designated refuge of quiet from disruptive human noise so that certain species can thrive. In the Grove, I sensed the redwoods deep in the practice of sitting zazen. Have you ever been to northern California and stood at the base of a redwood tree? If you have, you know first hand its majesty, its size, the trunk that you and even two or three friends cannot wrap your arms around. These trees reach unfathomable heights, strong and beautiful, lifting skyward. But what you cannot see when you stand at the foot of this tree is what is happening underneath. 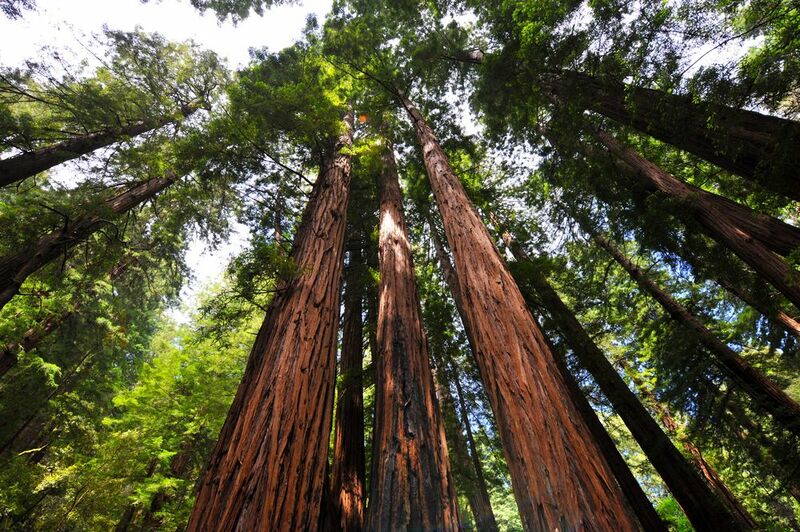 While a redwood tree can grow 360 feet tall, the roots are only, on average, about ten feet deep. This is because they spread their roots outward, searching for other redwood trees. Their roots intertwine under the ground, and they hold each other up. A redwood tree cannot stand on it’s own, and neither can we. Meditation is often a solitary endeavor. Though I've meditated around other people before, the week at Green Gulch was the first time I had spent a lot of time practicing regularly with others. It is a community of individual seekers, a seeming paradox: together, apart; apart, together. Like the redwoods, we can only reach our greatest heights when our roots are interwoven. I want to reach into that feeling of trees sitting zazen, that deep peace in our collective becoming. From that quiet space, I can do the work of life with wisdom and compassion.